Pycnoporellus fulgens is not common, in the woods or in field guides. Complicating things, as far as identification is concerned, it is apparently very variable in its appearance and ecology. (In fact, in my humble opinion, there may be several cryptic North American species "passing" as the Swedish mushroom first described by Fries in 1852.) And to make identifying Pycnoporellus fulgens even more difficult, it appears to be fairly frequently confused with Pycnoporellus alboluteus. In theory, Pycnoporellus fulgens is an orange polypore found on the wood of both conifers and hardwoods. 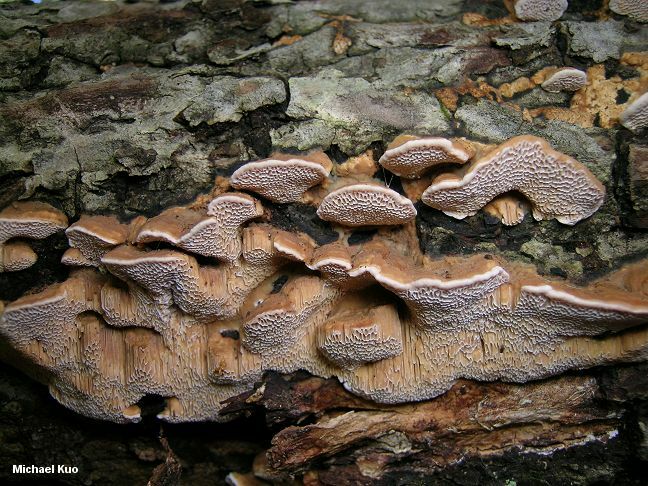 It has a distinctive pore surface on which the angular pores become stretched out and tooth-like (Fries originally called the species Hydnum fulgens, placing it with toothed mushrooms). Unlike Pycnoporellus alboluteus, it typically develops fairly clearly defined caps. 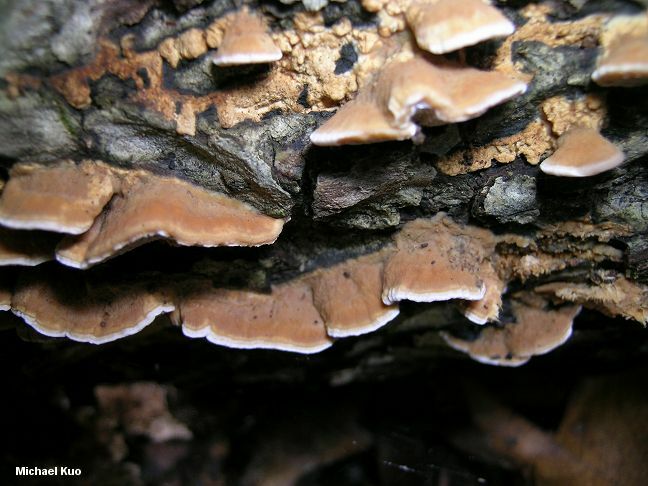 Its flesh is not strikingly soft and chalky like the flesh of Pycnoporellus alboluteus, and its reaction to KOH is red-then-black, rather than cherry red. Under the microscope, Pycnoporellus fulgens has smaller spores and cystidia, and hyphae that do not turn conspicuously bright cherry red when mounted in KOH. Pycnoporellus fibrillosus and Polyporus fibrillosus are synonyms. Ecology: Saprobic on the dead wood of conifers and hardwoods; causing a brown rot; annual; spring through fall; widely distributed across North America but apparently absent south of roughly the 38th parallel. Fruiting Body: Usually developing clearly defined, semicircular to fan-shaped caps, but often spreading a pore surface onto the wood below the cap; cap bright to dull orange, or orangish brown; cap surface velvety to finely hairy, often zoned; pore surface creamy to pale orange; pores angular, 1-3 per mm, becoming stretched out and tooth-like; tubes to about 6 mm deep; flesh thin, creamy to pale orange, softly corky. Chemical Reactions: Flesh red, then black with KOH. Microscopic Features: Spores 6-9 x 2.5-4 µ; smooth; cylindrical to elliptical; hyaline in KOH; inamyloid. Cystidia irregularly cylindrical; hyaline in KOH; 45-60 x 4-6 µ. Contextual hyphae reddish to hyaline or ochraceous in KOH; occasionally branching; mostly thick-walled; 2-9 µ wide. REFERENCES: (Fries, 1852) Donk, 1971. (Saccardo, 1888; Overholts, 1953; Gilbertson & Ryvarden, 1987; Roody, 2003; McNeil, 2006.) Herb. Kuo 10280703.